Time for another Christmas nail art tutorial! I have a folder in my computer with a few of my favourite nail art ideas that I occasionally draw inspiration from. I finally tried out this one and it was surprisingly simple, so I made it into a tutorial! I'm annoyed at myself now though - I didn't think to check who originally did these nails online (by searching the image) until after I had already done the tutorial! I would have credited her for the idea on the picture if I had thought of it. I sort of assumed that it'd be hard to find the original nail artists as there wasn't a watermark but actually I found her straight away. Turns out it was Kayla Shevonne, a brilliant nail artist whose blog I was browsing just a couple of days ago! So check out here blog here and the post for her Santa Belly nails here. Kayla Shevonne's nail art that I based my tutorial on! I simplified her design for the tutorial. I just did a straight line instead one curved like hers, and did dots with polish instead of using beads because not everyone has them. 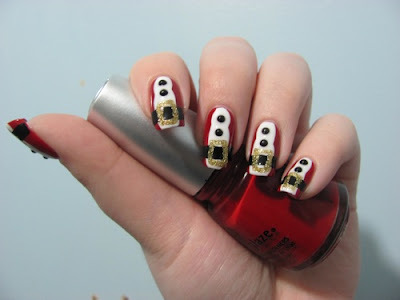 This kind of nail art is good for short nails too - check out my right hand here. I cut these nails last week, but it works quite well as it makes santa fatter! 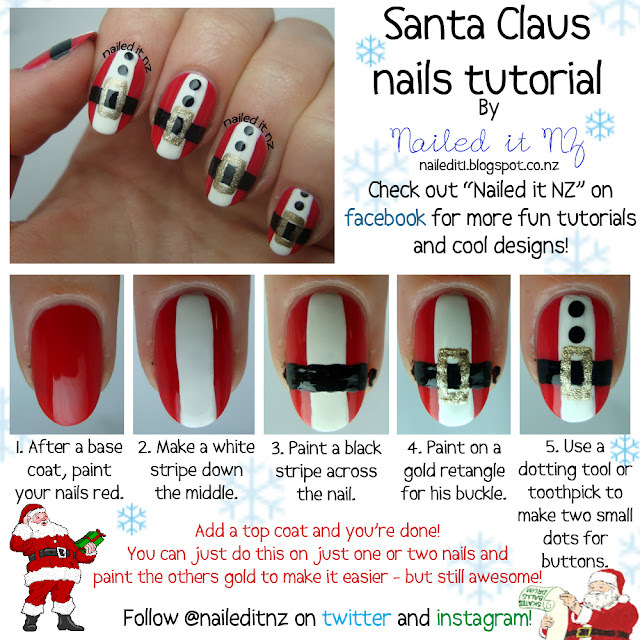 Skinny santas just aren't quite right, so if you have short, stubby nails this design is ideal for you! I'll try to do a couple more Christmas nail art tutorials - one will be as a guest post, I think. Exciting! I love this time of year. Hope you all like this tutorial! Although I can't claim originality over the idea I'm still pretty proud of how they turned out. If you do them, post them on my facebook page or tag me on instagram! My name everywhere on the net is naileditnz. Except Pinterest, that's kiwinailedit. Have a happy and safe Christmas! Super Cute, Jessie! I was going to do Santa suits but having a disasticure with them last year i've stayed away. Seriously, my white polish turned pink over night...it was awful! hahaha love them and maaayyy need to try them again. we shall see! Oooh eek that doesn't sound like much fun! I've had a white that just turned a red pink but that worked out okay in the end. Good luck if you try them again! Good whites are a must! That is a great tutorial. Simple and has the feeling of Christmas! This is cute! The design looks REALLY good on your nail shape :) Also great tutorial!